Creating a positive and supportive workplace for our restaurants’ team members is just as important as taking care of our customers. Chick-fil-A restaurant Operators are passionate about providing a welcoming, safe and inclusive environment for the more than 120,000 team members who work at Chick-fil-A restaurants across the country in the communities we serve. Our restaurant Operators are independent business owners who offer various opportunities for their employees to grow and develop – including, but not limited to, leadership development opportunities, work-life balance options, and competitive wages and benefits in their markets (often starting above minimum wage). Our Operators have created a wide variety of opportunities for their team members’ professional development and career growth. In many cases, this has included the potential for entry-level team members to advance into leadership roles within a given Operator’s restaurant business. In addition, many Chick-fil-A team members have achieved long-term career growth within the Chick-fil-A system by going on to become restaurant franchise Operators themselves – in fact, more than half of newly selected Operators over the past few years have had Chick-fil-A experience. For some team members, working in a Chick-fil-A restaurant has provided a great opportunity to begin developing or enhance employment skills and experience. Many have gone on to pursue professions outside of the Chick-fil-A system in a wide variety of careers, supported in part by the leadership skills and development opportunities they received working for a franchised Operator in a Chick-fil-A restaurant. Chick-fil-A has been awarding scholarships to help restaurant team members attend college since 1973. 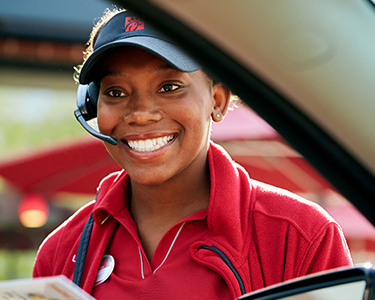 Over the last four decades, Chick-fil-A restaurant team members have been awarded more than $45 million in college scholarships to attend more than 3,000 schools nationwide. In 2017, Chick-fil-A enhanced its scholarship initiative and launched Remarkable Futures, which expanded our scholarship program and provides restaurant team members with three scholarship options, including the opportunity to receive $25,000 to attend the college, university, vocational or technical school of their choice. Chick-fil-A restaurant businesses are independently owned and operated by local franchised Operators, who employ the team members who work in their restaurants. To apply to become a Chick-fil-A restaurant team member, reach out to your local Chick-fil-A restaurant.